From whom were you expecting an answer? Were you not advised to lobby government instead of prattling on here? moa999 wrote: For less dense routes a fully electric bus can do everything a trolley bus can do without the poles and wires. I've only just come across this discussion. I can't keep up with the pace of where Myrtone pops up next! This isn't exactly correct. A trolleybus has 100% operational availability with no downtime, compared to a battery-electric or combustion-engined bus. It really is a quite superior type of bus (for passenger comfort too) IF you're prepared to take on the extra capital costs. Static battery buses (requiring stationary recharge) still have a significant downtime (including dwell time) and range issue. The better technology that's coming to the fore now is the dynamic electric bus that runs on battery and can be recharged on the move on shorter sections of overhead wire. 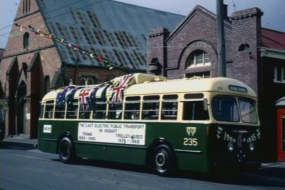 I remember riding the Hobart trolleybuses. They really were a very nice passenger experience compared to the typical British diesel bus that dominated government fleets at the time. If the technology of extended running off-wire on batteries had been available at the time, I'm sure some of these old systems in English-speaking countries might have survived, as they would have had operational flexibility, the lack of which at the time would have been one of the main reasons for killing them off. tonyp wrote: A trolleybus has 100% operational availability with no downtime, compared to a battery-electric or combustion-engined bus. It really is a quite superior type of bus (for passenger comfort too) IF you're prepared to take on the extra capital costs. Static battery buses (requiring stationary recharge) still have a significant downtime (including dwell time) and range issue. The better technology that's coming to the fore now is the dynamic electric bus that runs on battery and can be recharged on the move on shorter sections of overhead wire. Isn't the dynamic electric bus just like a trolleybus with an auxiliary battery pack, only that the latter uses external electricity by default? Static electric buses can be charged at various points along a route if scheduled correctly with the right infrastructure in place. tonyp wrote: I remember riding the Hobart trolleybuses. They really were a very nice passenger experience compared to the typical British diesel bus that dominated government fleets at the time. If the technology of extended running off-wire on batteries had been available at the time, I'm sure some of these old systems in English-speaking countries might have survived, as they would have had operational flexibility, the lack of which at the time would have been one of the main reasons for killing them off. Are you referring to diesel buses that already had engines under floors? By the way, rechargeable batteries did exist and I've read that Brisbane trolleybuses did have them. But maybe other large enough vehicles (like trucks) would have shared the wires with trolleybuses had auxiliary batteries been more widely available.